I wrote Why crofting is so important to law firms a couple years ago after Brian Inkster and I met online. Both of Scottish descent, we had much in common from the get-go. 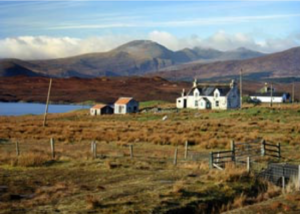 Why crofting is so important to law firms is not a spoof or a piece of trivia. It’s a serious message to all BigLaw business model firms and a tribute to the mercurial Brian at the same time. This post is written for practising attorneys, not just those with Scottish or Irish blood. Crofting is used as a metaphor to convey to law firms what Ted Levitt wrote about more than 30 years ago in Harvard Business Review in his classic ‘Marketing Success Through Differentiation—of Anything‘. It’s a truism that if as a firm or as a practitioner you’re not differentiated, then you’re commoditized. And by now we all understand that commoditization means competing on price….and competing your profits away. And competing your profits away is the surest way to earn a wage rather than to profits from the fruits of the firm you own. I won’t repeat Ted Levitt’s argument that (almost) anything can be differentiated. His famous article should be read – and re-read by everyone. Certainly, some things, e.g. currency trading, are very, very hard to differentiate. But, coming from Australia, I can tell you even so-called commodities like coal and iron ore can be differentiated to a degree, for example by the reliability of delivery in a just-in-time supply chain. My Ides of Maturity post on the life cycle maturity of traditional law and other professional services firms points to the magnitude of the forces at work that demand differentiation – unless owners are prepared to accept declining profits as inevitable. And this is where the crofting metaphor comes in. Brian Inkster founded a law firm in Scotland in 1999 and set out to differentiate his firm. Probably at the start he had a hunch that he could do it by specializing in a field near and dear to hearts of many Scots – the croft. Crofting is a form of land tenure and small-scale food production unique to the Scottish Highlands, the islands of Scotland, and formerly on the Isle of Man. Within crofting townships, individual crofts are established on the better land, and a large area of poorer-quality hill ground is shared by all the crofters of the township for grazing. Before you accept this argument check out the services offered by Inksters. All would agree that conveyancing, wills and family law, to name some, are familiar, largely commoditized forms of legal services provided to consumers. Yet Inksters has found ways to differentiate itself by focusing on and actively promoting legal services related to crofting. And other services benefit in the slipstream. This is by no means all Inksters does, but it gives the firm and its people a point of difference. And that’s life blood in a mature market.